Life is a series of day to day decisions. Do I wear the blue sweater today? How am I going to squeeze in both meetings? Some decisions have an immediate consequence- Damn, I wish I didn’t drink the rest of that bottle of Barefoot Riesling last night when I have an 8 AM presentation today. Some decisions have a long term consequence- Damn, I wish I started that diet back in January so I wouldn’t have to feed on pellets and 1.5 hour walks on the treadmill like a hamster. All decisions have an end result. Sometimes a minor decision like investing in Apple or Netflix stock before they blow up, or bringing a Ziploc bag of fat burning fibrous vegetables to fill up on during the day will yield dramatic results down the line. Some people love ‘em, some people hate ‘em. But, a simple and easy strategy to create a calorie deficit (the basis of losing weight) is the replacement of a starchy carbohydrate with fibrous vegetables during the day. This is the real secret to a lean body without drastically changing your lifestyle. Unfortunately most people don’t eat enough vegetables. 1 Why are vegetables good for fat burning? 3 Vegetables are the backbone of a solid weight loss diet along with protein and healthy- fat foods. Why are vegetables good for fat burning? The reason why fibrous vegetables are so effective for fat burning is that they provide the fiber and “bulk” to the diet but add very few calories. This keeps the metabolism elevated during calorie restriction (diet) because of the large volume of food the body has to process. Vegetables increase satiety (make you feel full) and keep blood sugar concentrations steady so that the fat burning process isn’t interrupted. If you want to truly be healthy and lean then a high intake of vegetables is essential. All vegetables are nutrient dense, yet sparse in calorie content, so make sure you select from a variety. Not many people realize a large plate piled high with any variety of vegetables contains less than 200 calories, and I guarantee most people couldn’t finish the plate! As you progress in your quest for leanness, increase your vegetable intake, this will definitely enhance your fat loss results. 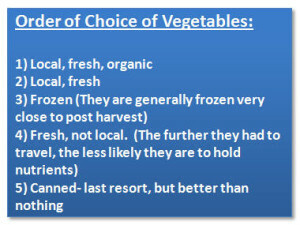 There are a few considerations when it comes to choosing vegetables. As a rule of thumb, I go by color. Many nutrition scientists believe that the color of a vegetable is a good indicator of the level of antioxidants and phytochemicals it contains. Asparagus, Beetroot, Bok Choy, Broccoli, Brussels Sprouts, Cabbage, Capsicum, Spinach, Tomato, Dark Green Lettuce, Green Peppers, Red Pepper, Cucumber, Green Beans, Peas, Artichoke, Turnips, Asparagus, Eggplant, Radishes, Cabbage, and Snow Peas. Listen, vegetables aren’t a supplement. They’re not something you sprinkle in to pretend your eating healthy. Vegetables are the backbone of a solid weight loss diet along with protein and healthy- fat foods. The point here is not to totally eliminate junk food. I’m not about eliminating all of your choices. I’m about making the proper choice most of the time, and have the junk food (if you feel you really need it) once in a while. Buy frozen, bagged vegetables from the grocery store. Before each meal, microwave a small bowl of vegetables and just scarf them down quickly. This way you get your veggies in, and you blunt hunger a bit, so whatever your meal will be, you’ll eat less total calories. Incorporate your veggies into your meals by “hiding” them in other foods, as brilliantly laid out in Deceptively Delicious. Q. Who’s going to have the leaner, healthier body? The 90% healthy eater. And you know what, that 10% wont even make a difference. That person could enjoy the weekend and not have to feel guilty. The 90% healthy eater goes right back to her winning ways without a problem. So, the moral of the story is- increase your fiber intake. Fibrous vegetables are low-fat and filling. You can eat more food and stay satisfied, even though calories consumed are much lower. So, eat your damn vegetables!